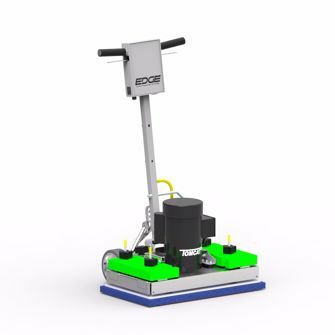 Tomcat’s EDGE Series of surface preparation machines can quietly remove finish without using chemicals. Increase productivity by eliminating water use in the ST model with a lower RPM motor in facilities like hospitals, schools, airports, sporting arenas, and office buildings. The HD model has a higher RPM than the ST model but that extra weight increases productivity with more down pressure. It consistently achieves a smooth scratch for floor preparations like gym floor screenings. It can be used like the ST model for refinishing tile floors but is recommended to include the dust containment kit for that application. What makes the EDGE Stick so popular? The handlebar is comfortable for operators and makes it easier to handle. Available in 3 sizes and 2 models, 20” to 32”. Square corners clean areas that traditional round pads miss. Environmentally friendly dry stripping is safer for operators and the earth. Dust control kits are available that include a skirt and water tank. Oversized wheels and isolators for durability and smooth operation. The Tomcat EDGE can be used with special application pads. For example, use the marble diamond strips and polishing pads for a complete refinish of marble flooring and it will shine like a mirror! It even has a tile & grout renovator pad to clean those stubborn old stains. Unlike other floor strippers, this one can get under over hangs and hard to reach edges.